Follow Newfound Gap road, you will see signs for a parking lot. They have a big parking lot, but it gets full, as this place is famous among hikers and travelers for an incredible view. Comfortable, sturdy and good grip Hiking Shoes as hiking path is rocky. Carry hiking bag, so you can keep all your required essentials. If you are hiking in a group than share the bag so that you don’t have to carry it all the way alone. At least 2 Bottle water and Energy Drink. As this hike will take minimum 4-5 hours depend on your speed carry required food such as fruits, protein bars or sandwiches. This trail is rocky and inclined so those who are not comfortable with it do think twice before hike this trail. For Charlie’s Bunion you have to park your car at the Newfound Gap Parking area. You will get a nice view from the parking lot itself. Those who are not hiking, they can enjoy the view from a parking lot. And those who are planning to hike, get ready and gear up with all your hiking essentials. I would advise you to use the restrooms at the starting point because you will not get restroom facility until you reach to shelter, which is about 3 miles. This trail called “Appalachian Trail”. 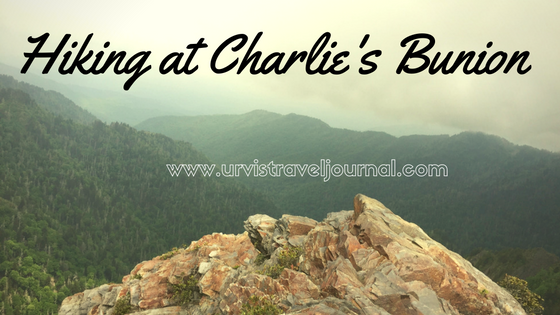 This trail also continues beyond “Charlie’s Bunion” so keep checking the signs. Sometimes they wrote “A.T” on the sign board. Charlie’s Bunion has 4 mile hiking one way, so around 2.7 miles are stiff uphill and 1.3 miles are downhill. Hiking trail has rocks and uneven surface so be careful while walking on the trail. This trail has made on the edge of the mountain which means it’s hilly and slant. In the rainy season this trail might get slippery so be careful. Instead of focusing to finish this trail faster, focus on hiking safely. There is no doubt, you will get to see the stunning view of mountains and valley. You can see in a picture posted here. I had never seen such an incredible view from the mountain. As this place was at a higher altitude you can see clouds cover the view every now and then. Everyone loves what you guys are usually up too. This sort of clever work and reporting! Keep up the awesome works guys I’ve incorporated you guys to my personal blogroll. Thanks for the significant tips I have really learned from the blog. Everything is very open having a clear description in the challenges. It was really informative. Your internet site is extremely helpful.